Upupa eremita Linnaeus, 1758, Switzerland. Monotypic. 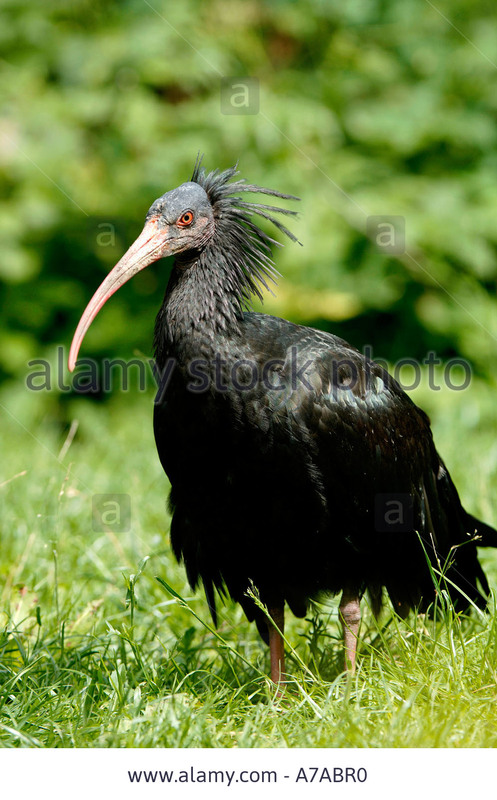 English: Waldrapp, northern bald ibis; French: Ibis chauve; German: Waldrapp; Spanish: Ibis Eremita. 27.5–31.5 in (70–80 cm); 2.5 lb (1,280 g). 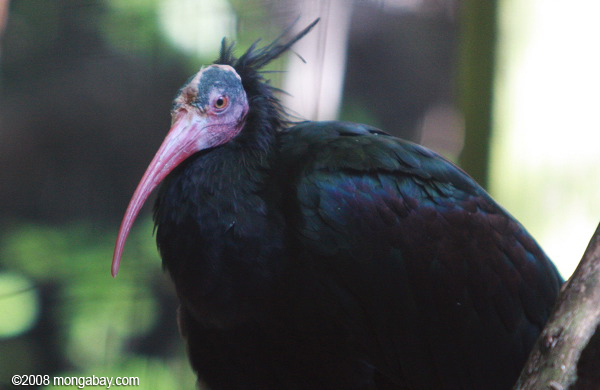 Plumage is dark with metallic green and purple gloss. 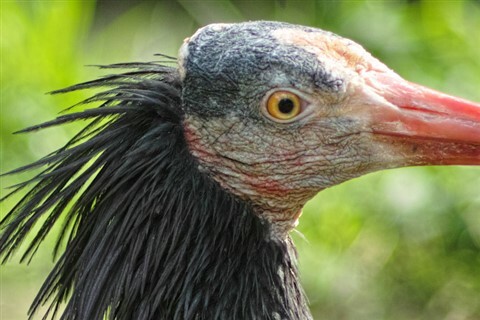 Front portion of head is bare (skin is reddish orange with black marks over the eyes), back portion features a crest of dark feathers. in Africa and Europe, but populations dwindled due to loss of habitat and mass hunting in the seventeenth century. Rocky plateaus, high-altitude meadows and streams, and arid or semi-arid plains within foraging range of riverbeds or ocean beaches. 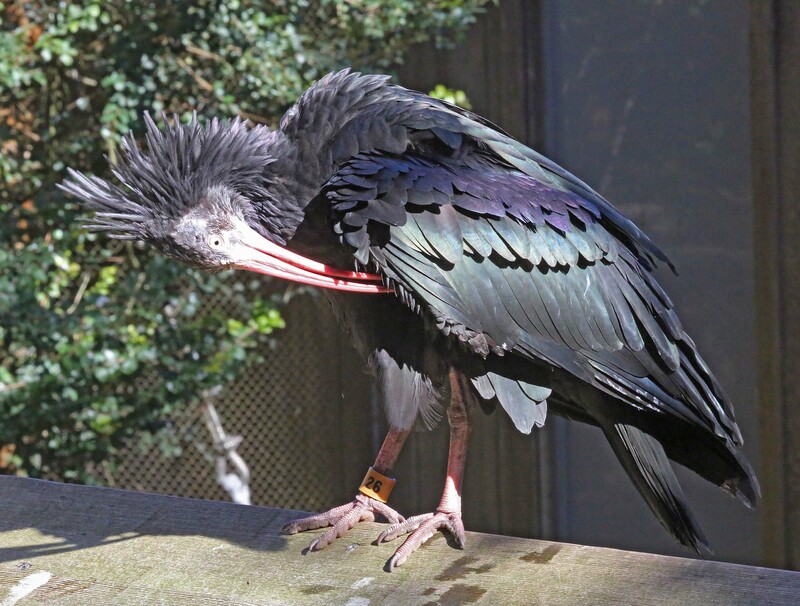 Except for the habit of nesting on cliffs, the hermit ibis is a typical member of its family. It is colonial, not given to loud calls, and spends its non-breeding days wading in the shallows. Primarily insects, larvae, spiders, worms, and small reptiles and amphibians. The species breeds colonially. Clutch size is usually two to three eggs. Adults feed not only their own young but also the young of other pairs from beak to beak. Incubation is 27 to 28 days, and the young are fledged after 46 to 51 days. Critically Endangered. A captive breeding experiment failed to save the Turkish population, leaving only the Moroccan colonies. 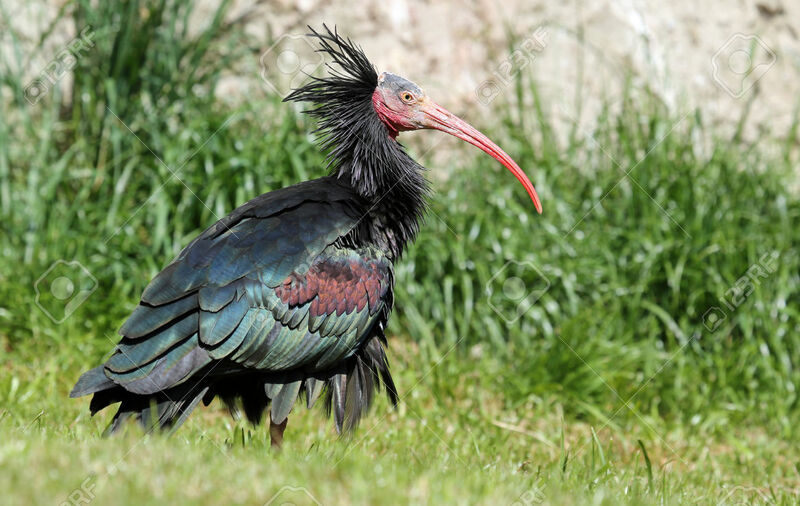 The hermit ibis has undergone a long-term decline and now has an extremely small range and population. The major reasons for the shrinkage of the species’ range include agriculture, development, and hunting. In 2001, the World Conservation Monitoring Centre estimated the entire population at 220 birds in the wild, plus 700 in captivity. No economic significance. In ancient times, the bird’s return to the Euphrates River was a harbinger of spring, and was celebrated with a festival.